Voted the World's Leading Airline (Business Class), Virgin Atlantic operates flights from Johannesburg to London throughout the yea. Unfortunately they no longer offer flights from the Mother City, but there are often affordable domestic connections to Johannesburg. Get a flight quote using the airline price comparison tool on the left, and then use SouthAfrica.TO travel vouchers to discount the cheapest flight! If you've got no travel vouchers, start earning them with your next Virgin Atlantic flight - simply email us a writeup of your trip and we'll send you a travel voucher. Always ahead of the curve, Virgin Atlantic has decided to introduce three new Economy Classes. Economy Light is the cheapest fare and a great option for budget travellers and light packers! This includes everyhting you need, but excludes checked baggage. Economy Classic flights are the most akin to traditional economy class flights, with one checked bag (mx 23 kg) included as well as advanced seat assignment. Economy Delight is the best option for those who want champagne on a beer budget. You'll be able to check-in at the Premium check-in desks at the airport and enjoy priority boarding when making your way to a seat with extra legroom. No need to break the bank for special treatment! South Africa is getting the special treatment as Virgin Atlantic announced the addition of a second daily flight between Johannesburg and London, the only city to get double daily flights outside of the UK and US. The outbound flight will depart London at 16h45 and arrive in Johannesburg at 05h40. The inbound flight will depart Johannesburg at 22h20 and arrive in London at 07h30. The second daily flight will be added on the 28th of October 2018 and can be booked from the 24th of March 2018. Sir Richard Branson recently announced that he is working on starting a cruise company under the Virgin brand called Virgin Cruises. Two ships are being built that will cruise the Caribbean and it will be based in Miami. Although no launch date has been announced yet these ships usually take at least two years to be completed. We can't wait to see Sir Richard impart his unique style on a cruise company. Imagine all the new technological innovations his cruise ships will be equipped with! A Virgin Atlantic flight from London to New York was forced to return to the airport after after a laser was pointed at the aircraft. The aircraft was turned around as a precautionary measure. There has been an increase in laser incidents, especially in the US, as handheld lasers become more affordable and readily available. Laser beams can cause disoriantation and temporary blindness and in some cases even burn a persons cornea. The threat to pilots is not taken lightly. Virgin Atlantic are now charging passengers for pre-selected seats. Clients can choose seats up to 336 days before their departure date at a cost of R440 per person for a one way flight and R880 for a round trip. Passengers who would like to select their seats prior to online check-in can do so through the ‘Manage My Booking’ link on Virgin Atlantic’s website. Always on the forefront of technological advances Virgin Atlantic started trialling the Google glasses earlier this year at Heathrow Airport. After several successful months they decided to roll this out across the United Kingdom and not just limited to the business class check-in desks. They are working on developing a system through which staff with Google glasses will simply scan your passport, find your booking information and print your boarding pass with a small portable printer attached to their belts. This will significantly reduce check-in time. Until such time staff will use these glasses to provide travellers with relevant information regarding the destination, their flight and the airport. It is still unclear at which airports in the UK this will be rolled out to. During the month of July 2014, passengers on the daily Virgin Atlantic flight from London, Heathrow to OR Tambo, Johannesburg will receive a SIM card from Virgin Mobile. The SIM card will be pre-loaded with R20 worth of airtime and 100MBs of mobile data. All of Virgin Atlantic's 300 daily passengers will receive this SIM card free of charge. They will thus be able to let their loved ones at home know that they have landed safely without having to stand in a queue to buy a new SIM card in an airport that they could be unfamiliar with. Virgin Mobile and Virgin Atlantic are both owned by Richard Branson's Virgin Group making this promotion a clever "inside job". This could only be a win-win situation for both companies as Virgin Atlantic is getting some good publicity from the promotion and Virgin Mobile is gaining potential new customers. Well done to Virgin! Must have been amazing listening to the Parlotones live on a Virgin Atlantic flight - no microphones, no electronics, just pure unadulterated musical bliss. "The aisle in first class was wide and we got lots of space. Premium was a bit better than economy, which was quite challenging; Neil was eventually in the toilet with the door open, banging on the drum." "In May of 1996, I was seconded to South Africa as part of a two-man team to set up Virgin’s first operation on the African continent. After many years of government debate, Virgin had finally secured lucrative landing slots at Johannesburg’s international airport and now needed a local operation in the country to support it. This would be a big job. Behind Virgin’s first tender steps into any new country, there was always a bigger plan – the Airline’s brand would be the first in Africa and would pave the way for other companies within the group to enter the market in years to come. Fifteen years on, there is a large Virgin presence in Africa – Virgin Atlantic , Virgin Nigeria, Virgin Mobile, Virgin Money and Virgin Active, to name a few. Despite the fact that I’d worked day and night to prepare for the interview process for this job, which I really wanted, I felt honoured to be recognized for my previous years of hard work and dedication. Virgin needed someone who had the reputation for getting things done, who embodied the entrepreneurial culture, and who had a strong sales and account management background. I fitted the profile perfectly! For me it was a dream come true. To be spearheading the launch of a brand such as Virgin on a new continent was more than I had ever imagined I was capable of. South Africa also held a special place in history after the end of apartheid and the release of Nelson Mandela eighteen months earlier. (Years later I was fortunate enough to meet Mandela as a guest of the Nelson Mandela Children’s Fund.). The transition was to be executed in true Virgin fashion – instantaneously, with little time to spare. Within days of accepting the position, I met my business partner and mentor-to-be, Mackenzie Grant, a seasoned veteran in the aviation business. I liked him immediately. He seemed to view me with some trepidation however. I was young, naïve and impossibly rebellious; he would have a lot to teach me. But inexperienced though I was, the enthusiasm , drive and willingness to learn more than made up for it. These qualities would certainly help us in our task, as we had only six months to build and launch a company from the ground up in preparation for the first flight in October...Looking back, I am amazed at how easy it was for us to get so much done in such a short space of time. But perhaps I shouldn’t have been surprised. This was Virgin, after all, and there wasn’t the usual time-consuming bureaucracy that one finds in organisations around anything – including a company start up; Mackenzie and I were able to simply take a flip chart and list the tasks to be done, dividing them down the middle. I took sales, PR, marketing, call centre and distribution, whilst Mackenzie took on office setup, airport operations , the clubhouse and financial. And that is the way my role in South Africa evolved – on a single piece of flip chart paper! South Africa was my training ground and would be the first of many international posts for me. I was now in a rotating pool of senior managers who would move from country to country doing similar things as Virgin’s international operations grew. I was literally flying...Richard arrived on the inaugural flight from London, with an entourage of British journalists and clients. Being the undisputed king of the publicity stunt, he rarely missed the opportunity to entertain, and as the first Virgin Airbus A340 to touch down on African soil taxied to the gate at the airport terminal, onlookers could see him in his Madiba shirt brandishing the South African flag from the small cockpit window. The passengers disembarked onto the tarmac beside the terminal building to a throng of waiting journalists and an assembly of African tribal dancers who helped to create a powerfully electric and moving atmosphere that was to remain imprinted on my memory for many years to come. Richard’s arrival was followed by several days of high-calibre launch events, media interviews, client lunches, sales blitzes and PR stunts. Wherever we went, we attracted a crowd of bemused onlookers, as well as opportunists, each trying to attract Richards’s attention with a new business proposal. Whatever your feelings about Richard Branson, he certainly knows how to win a crowd...For me, too, Africa had a style all of its own, one that had a huge appeal. I lived a wonderful lifestyle as one only can in Africa – a salary paid in English pounds , a large, fully furnished house with a swimming pool (standard issue in Johannesburg) paid for by the company, and a brand new Land Rover Discovery every six months as a company car. With the strong British pound and weak South African rand, it was like getting a pay rise every month. I still got to travel to England every three months for an international sales meeting, which gave me the opportunity to see my mum . What could be more perfect? I could never have imagined this lifestyle living in my two-up-two-down in Earlswood, Surrey, where it rained most of the time. Now in this perfect climate, I embraced outdoor activities, taking an off-road driving course and learning to scuba dive, overcoming my fear of deep water. I made quarterly long-weekend trips with my new found friends who also enjoyed the African outdoors, into Mozambique where the diving was absolutely magnificent. I also bought a beautiful black horse – a Friesian stallion called Dragon Heart whom I fell in love with the moment I clapped eyes on him. (I wish it was as easy to find a man that way!) He was a majestic creature and inspired great emotion within me. I often cried when I watched him work. When I wasn’t out riding in the country on the back of this magnificent animal, I was making frequent trips into the African bush, and to countries like Zimbabwe (before its real demise under President Mugabe), Zambia, and Mozambique. On other weekends I would visit the Cape wine farms and beaches. (Cape Town has to go down as the most beautiful city in the world for me.) I was now living the life of my childhood dreams – the life of an adventurer...Virgin’s workforce in South Africa was dominated by women (real men didn’t go into the travel industry in South Africa), and the environment was continuously filled with layers of temperamental oestrogen and it affected my mood. Working in London, I hadn’t noticed it, as I spent a lot of time out of the office with clients, and the male/ female ratio at HQ was more balanced." Caroline Ravenall, as quoted from "Stop Worrying, Start Living. : A guide for the spiritual worrier/warrior"
Virgin Atlantic offers power outlets in business class and first class. In premium economy power outlets are available on its A330-300s, some of its B747-400s and its B777-300ERs. Where prices are listed below, unless it's actually the morning of the date next to it, it's likely to be sold out. 22 December 2014. Boy how do we wish we were on the Virgin Atlantic flight from London to Boston yesterday! Yup Virgin Atlantic flights are usually pretty awesome but on this particular flight it seems Christmas came early! Each guest received their own Windows 8.1 tablet to take home, then Santa Clause decided to visit them twice - once virtually and once in real life. I'm sure all the children who started doubting Santa's existence will believe for another year or two- even if it is only for more awesome gifts like these! 31 October 2014. Virgin Atlantic South Africa has appointed Carla da Silva as its new country manager. Silva is the previous regional manager of Southern Africa and Latin America for Air Mauritius. She was also the head of Sales and Distribution for SAA. 4 September 2014. Virgin Atlantic announced that they will stop flying from London to Cape Town from the 26th of April 2015 and their final Cape Town to London flight will take place on the 27th of April 2015. Virgin has stated that the uncertainty surrounding new immigration laws did play a part in the decision to cut direct flights to and from Cape Town. This will not affect flights from Johannesburg. 27 October 2013. Virgin Atlantic resumes their seasonal flights from Cape Town to London. 25 June 2013. Delta Airlines have bought 49% of Virgin Atlantic, and set up codeshares on 108 routes. Virgin Atlantic are offering 91 Delta flight routes, and Delta are offering 17 Virgin Atlantic flight routes. Nov 2012. "Virgin Atlantic soars to the #2 spot in this year's UK Simplicity Index, up from #16. The ascent reflects the power of the Virgin brand and its "customer-centric" associations. It's a message that flies with customers and is reinforced clearly and consistently in advertising, on the Virgin Atlantic website and in communications that promote the Virgin brand rather than the product. "We are big Virgin fans. Their website is straight to the point."" World Global Simplicity Index 2012. Cape Town to London direct flights are resumed until April 2013: “Other airlines have stopped their direct flights between London and Cape Town, but we plan our routes to meet the needs and convenience of our customers. Cape Town is one of the key tourist destinations in South Africa, with its beautiful beaches and surrounding wine estates. We want to make it easier for international travellers to visit the city. By introducing the direct flight for summer, we believe this will drive additional tourism to both London and Cape Town by offering convenience along with the unique Virgin experience our passengers love. The direct route also cuts down costs, whichever way you’re flying.” said Virgin Atlantic's country manager for South Africa, Simon Newton-Smith. The movie "Departure Date" was shot on Virgin Atlantic aircraft at 35,000 feet. It showcases what's on offer in first class. Virgin Atlantic birthday fares, R6409 for a return flight from Johannesburg or Cape Town to London. Celebrating 16 years of flying between the UK and South Africa, Virgin Atlantic's Country Manager for South Africa, Simon Newton-Smith, says: “As we celebrate 15 years of connecting two of the world’s major hubs, it has been a pleasure for Virgin Atlantic to re-unite family and friends and carry tourists to some of the world’s most beautiful holiday destinations. Last year we contributed an estimated R400 million to the tourism economy of South Africa and, as we increase the number of flights between London and Cape Town, we demonstrate our continued commitment to South Africa and to ensuring a practical and unique flying experience for all our passengers." Virgin Atlantic's Chief Executive, Steve Ridgway, says: “As one of the first new airlines to start flying to Johannesburg 15 years ago, Virgin Atlantic has played a crucial role in supporting the growing business and tourism links between South Africa and Britain. Indeed this year we have seen a record-breaking amount of cargo exported from Britain to South Africa and the amount of freight transported between the two countries is up almost a third compared to last year. We’ve moved pretty much everything from flowers, books, machinery, car parts and yes…..even kitchen sinks. We are keen to further strengthen trade between these two nations”. Analysis of month-on-month Virgin Atlantic London flights. Virgin London & New York flight special. Virgin Atlantic is announced official carrier of the England Football Team, after BA had been official carrier for the previous 3 World Cups. Richard Branson said "It is a great honour for Virgin Atlantic to be carrying the England team to Johannesburg. We promise they will be looked after in style by our world-class cabin crew, so that when they arrive in Johannesburg they are fit and ready to take on the world. I, along with everyone at Virgin Atlantic, am sure they will make England proud." New Virgin Atlantic baggage allowance introduced. 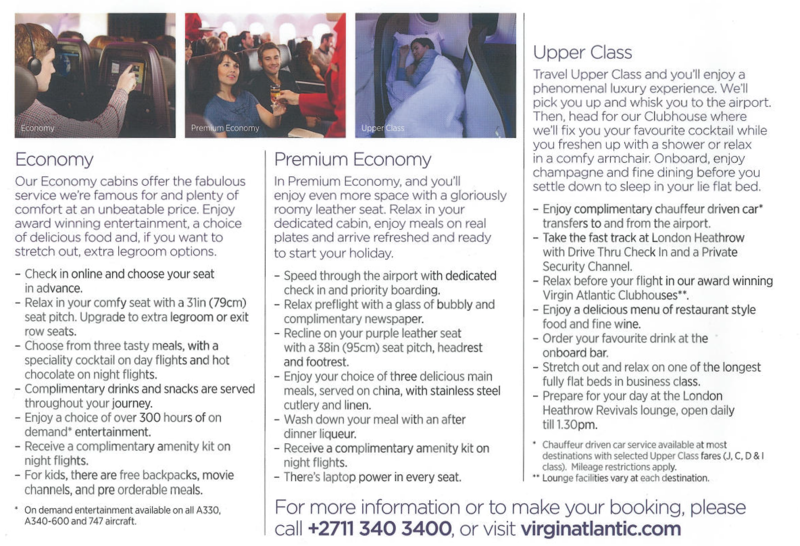 Virgin Atlantic specials in October. Virgin Atlantic's first flight from London to Johannesburg, the airline's first destination in Africa. Claire shares this touching tale of how Virgin Atlantic showed heart by offering 50% off on a flight to London for 2 boys who had recently lost their mother. K has her virgin flight on Virgin Atlantic and becomes a lifetime fan. A choice of 3 meals. Free drinks throughout most of the flight. Hours of entertainment on your own personal TV screen. Checked baggage and sports equipment allowance. Fares include all taxes, fees and surcharges. In 1992 Virgin was the pioneer of the premium economy class (it initially called it "Mid Class"). On Virgin Atlantic flights, Premium Economy flyers have an increased seat width of 21 inches, and seat pitch of 37 to 38 inches (compared to 31 inches average in economy class) - seat pitch is measured from where your seat cushion meets the back support to the back of the seat in front of you. An upgraded meal is offered.